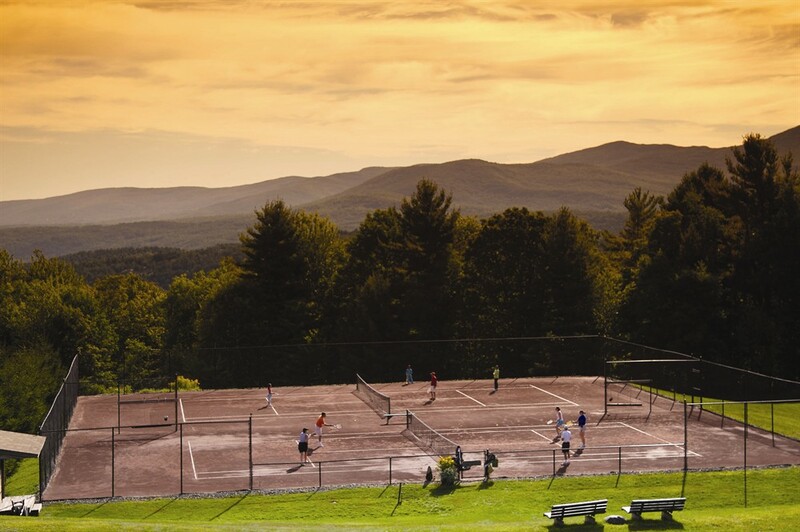 Whether you’re a beginner or a pro, you’ll love the tennis courts at Trapp Family Lodge. Our Stowe, VT resort offers four red clay tennis courts and tennis programs for all levels of skill, energy, and interest. The best part about tennis at our resort, besides the thrill of the game of course, is the view from the courts. 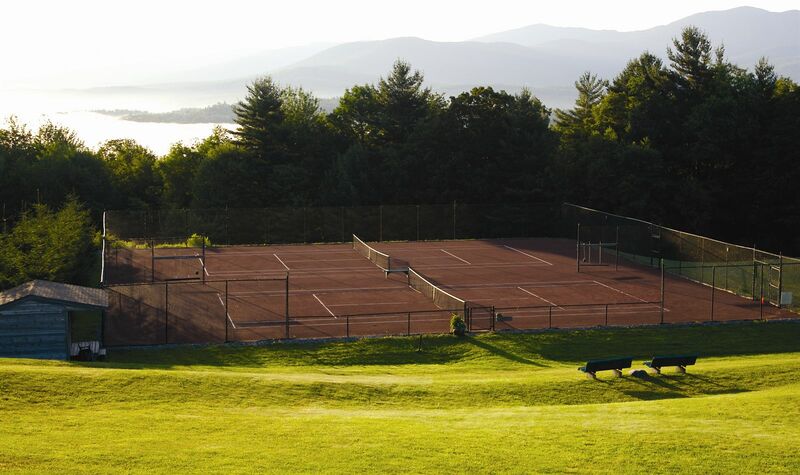 Our tennis courts are situated near the top of the mountain, offering the most spectacular views in Vermont. Quick Start Tennis is a new approach to introducing young players to tennis. We use low compression balls that are easier to hit, allowing more time to reach the ball and to help develop optimal swing patterns. Smaller racquets also help make learning more enjoyable. Time schedules may vary depending upon the makeup of the group. Contact the Fitness Center for more information about scheduling. Our tennis courts are now open for Pickleballers! Pickleball is a paddle sport that combines elements from badminton, tennis, and table tennis. In this game, two or four players use solid paddles to hit a perforated ball, similar to a wiffle ball, over a net. Court #3 is lined and ready to go for all who want to Pickle. Equipment can be signed out free of charge at the Fitness Center. While there is no fee to reserve our tennis courts, we ask that you prepare it for the next set of players when you’re finished playing. This allows us to keep the court usage on a no - fee basis. Your cooperation is appreciated. The Trapp Family Lodge tennis program can accommodate all skill levels, energy and interest. Every lesson will meet the needs of the individual, from beginner fundamentals of stroke refinement to advanced footwork and tactics. Enjoy these programs on one of our four beautiful red clay tennis courts located just below the Fitness Center. Our new Tennis pro, Ben Oliveri, is a familiar face here at Trapps – you may have seen him at the Bierhall. Ben has been playing tennis all his life, competing at the high school and collegiate Division 3 levels. Sign up required 24 hours in advance at our Fitness Center, or at extension 5722. Please arrive 5 minutes prior to start of clinic. For further information or to reserve for one of these clinics, please call our Fitness Center at x-5722 or feel free to stop by in person. We also offer racket stringing for $35.